The latest addition to the 3E Series line of compact utility tractors, the 3025E offers professional landscapers with a machine that combines capability and comfort at an affordable price. 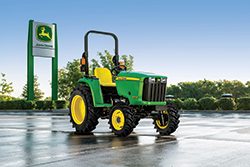 The 25-hp compact utility tractor features an easy-to-use, two-range hydrostatic transmission (HTS), increasing tractor performance while eliminating clutching for fast and easy change of direction. A true workhorse, the 3025E can be transformed with a variety of implements, from box blades to rotary cutters, tackling any chore that professional landscape contractors may face on the job site.